AVON, Ind. -- It was the worst 12 minutes of Heather Rice's life. Rice, a grandmother to a baby girl named Jordyn, received a phone call this week from an unknown number. On the other end was her daughter, Holly. 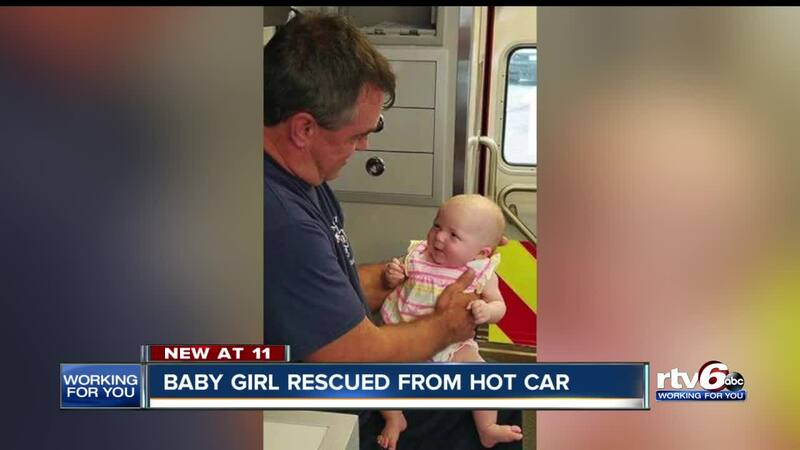 Holly's baby girl was locked in a hot car in a Meijer parking lot in Avon. "I completely went into meltdown mode immediately," Heather said. Holly said a simple mistake happened so fast, putting her child in a life-threatening predicament. She said she went to get a cart in the parking lot and left her keys on the seat of her car. The wind shut the door, and Jordan must've kicked a button on her keys, locking the door. "I was in a complete panic attack," Holly said. "That is some scary stuff." Holly used a bystander's phone to call her mother, who rushed to the store. When Heather arrived, police were already trying to help. They yanked and pulled on the door, but it wasn't opening. "I look in [to the car] to see Jordyn and Jordyn was in distress," Heather said. "She was extremely hot." After a couple of minutes, the officers got the door open. Holly pulled the car seat out with her daughter still in it. The baby was flushed, sweaty, and her clothing was soaked. Jordyn was placed into an air-conditioned police cruiser until paramedics arrived to check on her. "She was fine," Holly said. "They said if it had been any longer, it might not have turned out the way that it did." It was 12 minutes from the time Heather received the call from her daughter to the time the door opened. In her mind, it's a lesson to show how anything can happen so fast. "It was a simple mistake," Heather said. "And people don't realize 12 minutes, what that can do a baby. To a child. Trapped in a car with no air. And I think it's very important that our world learns that it doesn't take an hour. It doesn't take neglect. It can be a simple mistake. A simple judgment. If this can save anybody from having to go through this, it's worth it."